I originally read and reviewed this book a few months ago. I didn’t even read what this book was about I just saw the author’s name and thought oh yes! Mark Fowler has such a unique writing style, I would love to be inside his head just to see how all these ideas come together. He is the odd ball to me, the soldier walking out of step with the rest of the platoon, but in the best possible way. A category just for himself. This story is about death, not dying but death himself, the coffin maker but he has lost his way a little and doesn’t know where he sits in the grand scheme of things. As death or the coffin maker, he creates a coffin for every person gradually building it as we go through life and when the last nail is banged in we die. Just to complicate things even more death is given two apprentices Hieronymus and Beezle both extremes of each other in outward appearance to their characters. Life was simple before but not now. With Mark Fowler it is never simple, complicated no, just very diverse with not a cat in hell’s chance of guessing where all this is going, but boy I wanted to go with it. You have to read this book with a very open mind, don’t second guess and let Mark Fowler just take you along, leave all the normal stuff behind and let him fill your head. There is some very gruesome stuff at times but there again this is death so expect anything, well anything bizarre. I won’t ever hear an helicopter again without thinking of this book. You have to see it to believe it and he does put these images in your mind! I just hope that Mark Fowler is working hard on another book, Awesome. 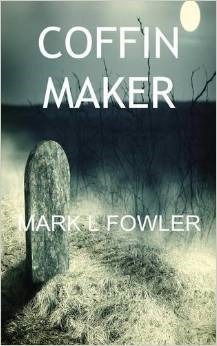 Mark L. Fowler is the author of the novels Coffin Maker, The Man Upstairs, Silver, and Red Is The Colour, and more than a hundred short stories. His particular interests are in crime and mystery, psychological thrillers and gothic/horror fiction. His first published novel, Coffin Maker, is a gothic tale set between our world and the Kingdom of Death. In the Kingdom the Coffin Maker lives a solitary existence, and every coffin he completes signals the end of a life in our world. One day he discovers that he is to be sent two apprentices, amid rumours that the devil is arriving on Earth.